On May 31, 1930, Ralph, Muriel and infant Sheila set sail from Liverpool aboard the "SS Adriatic" bound for New York. Both Bramley and Denys were at boarding school and did not make this initial trip, although over the next 6 years they, as well as Ralph, Muriel and Sheila were to travel back and forth across the Atlantic. In order to promote his work in the US, Ralph had published an illustrated booklet titled English Gardens in America in which he described himself as being 'Landscape Gardener to HRH the Princess Victoria of England'. The booklet must have worked as his new company, English Gardens Inc., quickly became successful. He staged exhibits at the Massachusetts Horticulture Show where he won several awards, including the 1933 President's Cup and the prestigious Albert C Burrage Gold Vase, the latter for a Rock Garden at the 1933 Spring Exhibition. This delightful image (left), of Jackie Kelly, of New York, was taken as he fished in a rock pool created by Ralph for the 12th Annual International Flower Show at Grand Central Palace, New York, on 20 March 1933. The entire exhibit was over 300 square foot. Ralph won second prize (open class). One of many awards that Ralph collected during his time in the United States. Ralph was also one of the designers of the Lydia Duff Gray Hubbard garden in Upper Montclair, New Jersey, which now forms part of the Garden Club of America Collection. Ralph was also associated with the fledgling American Rock Garden Society (now NARGS). In order to promote his company, Hancock built a small Exhibition Garden in a cul-de-sac just off of Oakwood Avenue, Upper Montclair. This was close-by to the home where Ralph, Muriel and Sheila settled when they first arrived in America. Sheila Hancock recalls that Ralph still owned the land right up until the mid 1940's. Ralph was a familiar face on the lecture circuit where he gave regular talks about his work, including a lecture on English Gardens to the Women's Club of Upper Montclair in February 1931. In April 1932, Ralph was reported in the New York Times as giving a talk on Rock Gardens to the Women's Club in Maplewood, New Jersey and in January 1935 Ralph gave a lecture on Good Horticulture at the Annual Meeting of the School of Nature League held at the prestigious American Museum of Natural History. Muriel too was also a familiar face on the social circuit and was regularly seen with Ralph at various social gatherings. In May 1931, she was one of the judges of the Annual Flower Show held by the Garden Department of the Maplewood Women's Club. Like many of his modern day contemporaries, Ralph saw the benefit of using the medium of the time. He regularly appeared on the many New York radio stations such as WMCA 570, where he spoke about his work and gave tips and advise on gardens and horticulture. But it was between 1933 and 1935 that Ralph was to embark on one of his most ambitious projects, the construction of spectacular gardens at the Rockefeller Center in New York. Hancock’s “Gardens of the Nations” emulated the cultural styles of gardens from Holland, France, Spain, Italy, Japan and England. 3,000 tons of earth, 500 tons of bricks, 20,000 bulbs, 100 tons of natural stone, 2,000 trees and shrubs were delivered by the service elevator or man hauled using a block and tackle up the side of the eleven ﬂoors of the building. Hancock also designed an English Garden, complete with turf directly imported from England. Low Cotswold stone walls, Tudor arches and espaliered fruit trees featured within this slice of the old country. It was also within the English Garden that Ralph had his own private garden, complete with an antique sundial. As this picture shows, the sundial can still be found in what is left of Ralph's private garden. Photographed in April 2007 by Hancock's granddaughter, the sundial is now damaged but the reader can still make out most of the stone mason's handiwork. On the opposite side of the roof to the English Garden Ralph installed an International Rock Garden. Stone from the English Lake District and Alpine planting were complimented by a waterfall and a running brook. This spectacle required 96,000 gallons of water which was lifted by an electric pump to the eleventh floor. Hancock was confident that what he had created would allow numerous opportunities for other similar gardens in the US. He declared that “the day of penthouse gardening are over and miles and miles of roof space in every metropolis in this country remain to be reclaimed by landscape gardening”. Throughout the project Ralph was in regular correspondence with both John D Rockefeller and Nelson A Rockefeller. Letters between the Rockefeller's and Hancock give an insight into their interest in what Ralph was creating. The 11th floor Gardens of the Nations were opened on 15 April 1935 by New York Mayor Fiorello LaGuardia. The event was attended by 400 guests, including the ambassadors of the countries represented by the gardens which Ralph had created. Those also in attendance included prominent horticulturists and the guest of honour, Nelson A Rockefeller. 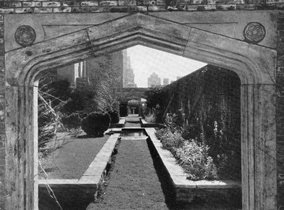 The gardens were officially opened to the public the following day, 16 April, with a fete for over 2000 friends, alumnae and students of Bryn Mawr College. The New York Times of 17 April 1935 reported; "Bryn Mawr girls wearing the costumes of various nations were to have dispersed themselves among their national flowers, but a blustery wind drove them inside. Nevertheless, $10,000 was raised towards the college's $1 million appeal fund". The image left is of Miss Nancy Nicholl, a Bryan Mawr alumnus seen in costume within the Japanese Garden. In their first 7 months the gardens attracted over 87,000 visitors, each paying $1 to view the spectacle. They closed at the end of 1935 and over the winter they were replanted with 50,000 bulbs. The following year the entrance fee was reduced to 40 cents. Despite the popularity of the attraction the “Sky Garden Tour” ceased to make money and closed its operation in 1938. The gardens themselves remained a favourite venue for various garden and flower shows. The New York Times of the period carried advertisements for the Gardens of the Nations. As well as the more familiar internationally themed gardens Ralph had also designed and installed a bird sanctuary, a rock and vegetable garden and a 'modern' garden. A guide, containing photos of all of Ralph's gardens, was available to all those who visited. Also on the 11th floor, Ralph operated the Horticulture Halls, where members of the public could buy anything from bulbs to garden furniture. Gardening clubs regularly met there and there was always someone in attendance ready to give gardening advice. As well as the Gardens on the Nations, Ralph also created spectacular gardens atop two lower level buildings. The British Empire Building and La Maison Française (both fronting Fifth Avenue). 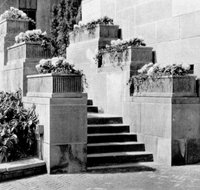 He also designed planting for Rockefeller Plaza and the ground level Promenade. 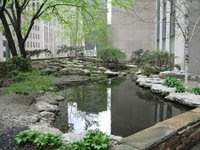 The image left is of the spectacular garden which Ralph created on top of The British Empire Buildig on Fifth Avenue. A similar garden was also created for the roof of the La Maison Française. After Ralph returned to England in December 1935, where he was to design and create the roof gardens at Derry and Toms, it was left to William J Hoffman (Manager of the Gardens of the Nations) to care for what Ralph had so lovingly created. A small army of gardeners were employed to maintain the lawns and gardens. Ralph had left detailed instructions for the maintenance of his creation but, despite his best efforts, they were not always adhered to. In 1942, with Japan now at war with the United States, the Japanese garden was removed, even the bamboo arch and established cherry trees were destroyed. In their place a Chinese garden was established complete with a traditional moon gate. They were formally opened by Dr Hu Shih, Ambassador to the US. Sadly, the Gardens of the Nations no longer exist in their original form. The two images below show the same scene over 70 years apart. The Tudor arches and Cotswold stone walls as well as the screen have all but gone. In the far distance we can just see where Hancock's private garden would have been. All that remains is the damaged sundial. In recent years other parts of the gardens have also been destroyed or altered beyond recognition. The two very similar images show the stone steps that lead up to the Gardens of the Nations from the English Garden and the International Rock Garden. The concrete planters have now long disappeared leaving the steps bland and uninteresting. The addition of handrails has no doubt pleased those concerned with health and safety, but detracts from what is quite a simple but beautiful way to ascend into the upper levels of the gardens. Once at the top of the steps the visitor was greeted by beautifully designed gardens. This aerial view show how these once splendid gardens must have looked when they first opened in the 1930's. In the bottom left of the above aerial image one can quite clearly see the babbling brook that has now become a mere brackish pool, a river that has been truncated in its flow. What were once beautiful representations of the garden styles of many nations have now totally disappeared. It is not known what happened to the many statues and urns. They, like the gardens themselves have been confined to the memories of those lucky enough to have witnessed them firsthand. Thankfully, not all has been destroyed or altered as these two final images show. Apart from some minor changes to planting, and a missing fountain, this delightful garden scene looks much as it did when Hancock added his final touches in 1935. Gardens atop the British Empire Building, circa 1935. In 2017, NBCUniversal announced ambitious plans to reopen the roof space on which the Gardens of the Nations had sat. After much planning and construction the newly refurbished Rockefeller Roof Garden opened to employees and their guests in the summer of 2018. As well as restoring many of the Cotswold stone walls, NBCUniversal also reinstated much of the original planting. New handrails and new flagstones were also added opening up what had been a neglected but usable space.